Want to win free gift cards? Get out of here. There is no such thing as those. That's exactly what others say. I like gift cards especially when they are free. Who doesn't, right? I would be more inclined though to carry them than cash because my wife tells me I lose cash all the time. Believe it or not, you can get free gift cards fast. 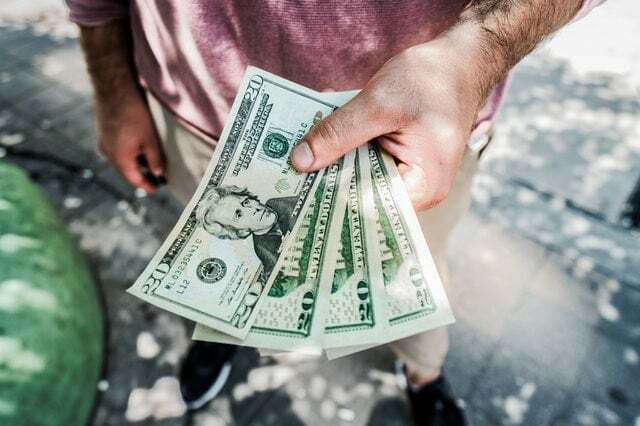 If you are lucky, you can easily make as much as $2,000 in a month. You don't even need a credit card to get them because they are free. In this post, I will explain in detail what you can do to get free gift cards the quick way. 1. Share your opinions and get those free gift cards. When was the last time you shared your opinion and gotten paid? Companies are now paying select online survey sites to recruit members just to get their opinions about these companies' products. These survey sites pay in hundreds, and a select few pay in thousands every month. The amount these sites pay is quite outstanding! 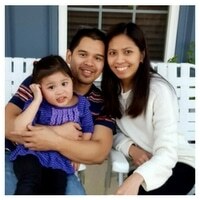 My wife and I have earned more than $6,000 since we started taking surveys on a part-time basis. Some will even pay you $115/survey or $50 in ten minutes. The money from these surveys can help you buy gift cards plus some more. Survey Junkie: Tia made $615.56 in 10 days from Survey Junkie just by answering surveys during her free time (see image above). Survey Club: Some of its surveys pay at least $115/survey. 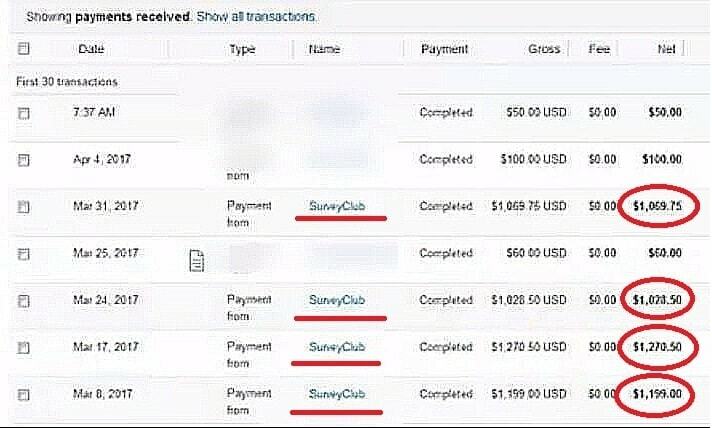 One even made over $4,000 in a month from Survey Club (see image below). 2. Step into the store, scan, and get paid (just like that). Literally, you just step into the store and scan barcodes of select products and you'll eventually get free gift cards. So, what's the crazy app that's doing this? That app is called Shopkick. Whenever you step into a store and/or scan barcodes, you'll get kicks (i.e. points for free gift cards). You also earn kicks when you visit Shopkick's online partners via Shopkick's site, view select offers, or make online purchases. Use these kicks to redeem for gift cards for stores like Target, Walmart, and Amazon. If you don't want to go to the stores, just drive by close to the stores and you'll still get the points once the app checks you in. Click here to download and use the app for FREE. 3. Do anything and get paid for that (No kidding!). I recently found a site that pays you to do almost everything you do every day. From shopping online, watching videos to playing games, you can get paid. I'll admit that I'm a fan already. It's a shame MyPoints hasn't been around for a long time, but it is here. Now, you could get free gift cards online and even money without doing something out of the ordinary. Now, almost every single thing I do online means either free money gift cards. For a limited time, spend $20 or more and receive a $10 balance on your account if you sign up thru my link. Click here to start using MyPoints for FREE and earn rewards without lifting a finger. 4. Get paid for buying groceries (I made $383.25). When was the last time you got paid for buying grocery items you normally buy? If you have never or can't remember, then, you're leaving a lot of money on the table. 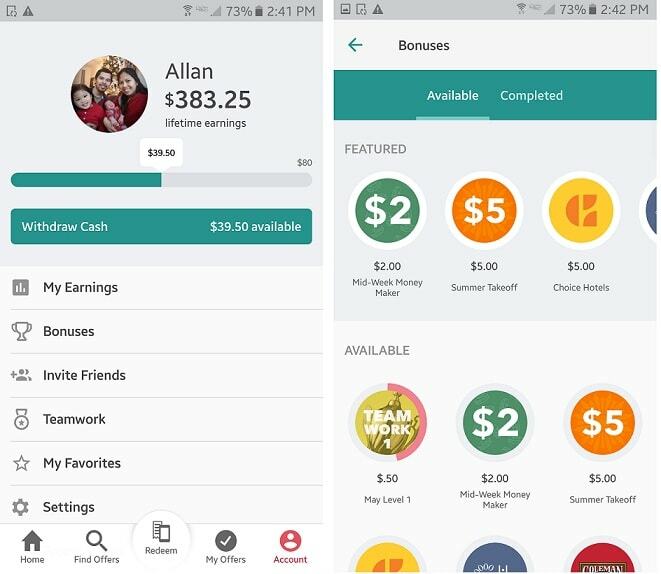 Ibotta is a FREE app that helps you earn cash and gives you free gift card rewards for everyday purchases. It's extra savings you use on top of your other coupons. When you use Ibotta and coupons together, you'll see a lot of savings. Actually, I opened an account 4 months ago and I've earned over $383.00 in 4 months (see image below). Crazy, right? Did I also say you'll also get bonuses when you join some of its rewards programs? 5. Sign up for Swagbucks and get $10 bonus (I made $1,550). If you like MyPoints, then you will certainly love Swagbucks, too. Better yet, if you use both of these (i.e. one on the background while you're actively using the other one), you could be doubling your earnings. Swagbucks = Free gift card rewards. That's the right equation. Whether it's searching the web, playing a game, reading a book, etc., Swagbucks has ways to make you money. No kidding I have made at least $1,500 with Swagbucks (see image above) in 7 months. Crazy, right? Yes. Genius? Absolutely. Try 1 month of Hulu for $5.99 and get $20. Click here to start with Swagbucks for FREE. For a limited time and if you sign up using my link, you will receive $10 bonus. Get the bonus now before it's gone! 6. eBates (Get cashback on your online purchases + $10 gift card). Just sign up for an Ebates account and get your $10 bonus after your first purchase. That's it. Ebates is one of my favorites for making and saving money at the same time while shopping online. It gives some of the highest cash back percentages, as much as 40% cash back in over 2,500 stores. Just use Ebates portal and you'll start accumulating rewards right away. You can also download and activate the Ebates browser extension and it will prompt you whenever you're shopping on an Ebates partner site. You can redeem your rewards as gift cards or free money. It's all up to you. Sign up with eBates and get a $10 gift card from Amazon as a welcome bonus. It's super easy extra money. 7. Use Drop app to get automatic free gift cards. Drop is a service that helps shoppers cash back when they make almost any purchases. You can get cash rewards for whatever you spend on every day either on or offline. In short, you never have to look at which sites have coupons and deals. You don't need to do anything other than continue what you're doing, and you'll still get rewarded for your purchases. Click here to use Drop app and get cash rewards for FREE. 8. Use this Chrome extension and get paid. I was at a friend's house one day. He was looking for an air ticket to go to Vegas and I, by accident, looked at his computer and saw this small Chrome extension on his desktop. I was curious. So, I asked him and he said it's called Honey app and it's his magic recipe for getting cash back and/or gift cards. For every 1,000 points you earn from purchases, you'll get a free $10 gift card. Yes, you won't need to go to Retail Me Not, Groupon, etc. to get the coupon codes and find and try the best one to give the most discount. Honey app will do that for you. From A to Z companies (e.g. Amazon to Zappos), you'll find the best coupon codes without you lifting your fingers. Click here to use Honey app and get the best coupon codes all the time. Plus, get your free gift cards online after you've accumulated enough points. 9. Use hashtags to find your freebies (I bet you didn't see this one coming). How often do you use hashtags in your posts whether those are on Instagram, Facebook, or some other social media platforms? So, why not use certain hashtags to see if you can score free gift cards or other freebies. As of this writing, I am finding the following free stuff from Instagram using the hashtag #freestuff. 10. Buy gift cards to earn free gift cards online. Sometimes, we don't have too much time to wait on accumulating enough points to get free gift cards. Some of us have busy lives that we can't take a minute or two to try some of the tips above. Does that mean you won't get free gift cards anymore? Not necessarily. You can buy discounted gift cards at Gift Card Granny and eventually, get a free gift card. I became aware of this trick through my friend who doesn't have time like I have. Well, that's just dumb. It is, but it isn't. Intrigued yet? When you buy discounted gift cards at Gift Card Granny and join the Granny Rewards, you'll earn points. When you reach 1,000 points, you then can redeem those for free gift cards. It makes sense though. If you need gift cards, why not buy them at discounted prices and get reward points for that. Click here to buy your discounted cards and start accumulating points to get your free gift cards. FreeMyApps works like a marketing platform for its partner apps. You just have to download FreeMyApps and register using a verified Facebook account. Download the free sponsored apps. Play games to earn points for gift cards. Watch fun and new videos. You get credits for every app, games you try or videos you watch. Redeem your credits for gift cards such as Amazon, Visa Prepaid, PSN, iTunes, Starbucks, and so much more. FreeMyApps is free to use and available for all Android and iOS devices. You might end up getting free gift cards codes. Gift Wallet is a rewards app that lets you earn gift cards or cash via PayPal for FREE! The app is very easy to use. Just download the app, tap “Earn Points” and complete the offers to earn points within the app. You can choose from Chests, Games, or Tasks to get coins. You can also earn points when you share your referral code to your friends on your social media accounts. When your friends get at least 5 points for completed tasks, you get 30% of your friends’ earned points. 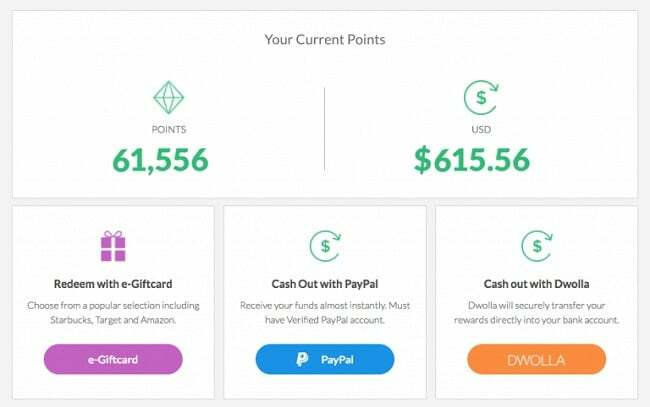 Convert your points for free gifts from Amazon, Google Play, PayPal cash, and more. Check out Gift Wallet app to earn your money gift cards on your Android phone. Perk is a fast-growing rewards-earning app. There are plenty of ways to earn points with Perk. Watch videos on Perk TV, Perk TV Live or Viggle. Play Scratch and Win to win points, tokens, and prizes. You can also play the Perk Pop Quiz to earn more points. Exchange your points for gifts cards such as Amazon, prizes, and cash. But if you’re feeling generous, you can choose to donate your points to various charities and causes. Download Perk for free and earn gift cards on your iPhone and Android mobile phone. The probability of watching TV and getting paid for doing it is like hitting a jackpot. It is close to nil. But did you know that there is actually an app that does that? Viggle is a free mobile app that earns you points while watching live or streaming programs. The longer you stay, the more you earn points. Every few minutes, the app will require you to interact with it to know if you’re still watching. Watch out for bonus point badges (2x, 3x, or more) to score more Perk Points when you watch on the Bonus Shows section. You can convert your points to cash or redeem your points for over 800+ gift cards options. Surely, it’s one of the best free gift card apps that you can use. Check out Viggle here and start earning now! Are you good at keeping secrets? Do you find mysterious attractive? If yes, Mobee is a free mobile app that lets you be a secret shopper. Be an undercover shopper, complete fun and easy missions at partner shops and retailers. Each completed mission brings you closer to getting new achievements and receiving more points. Earn points by sharing your feedback while you shop and dine at you go-to places. For quality purposes, upon completion of your mission, it will be reviewed by Mobee within 48 hours and the points you earned will be credited to your account afterwards. Redeem your points for Amazon gift cards or free gift cards from Target, Walmart, Mastercard, Starbucks, and a lot more. Try out Mobee, one of the best free gift cards apps in 2017 and 2018. Getting free gift cards isn't rocket science anymore with these tips and tricks. I was frustrated because while some people were getting these cards left and right, I, on the other hand, wasn't getting any. That changed when I learned the genius ways I stated above. Don't let anyone tell you that you can't get these free gift vouchers for free because you can and you would. Are you ready to get these gift cards? Which gift cards do you like the most and use all the time? Have fun hunting those and let me know how your experience was in trying to get these free stuff.